These bearings are specially designed for rolling mill applications where their thin cross-section height and increased width provide higher capacity. 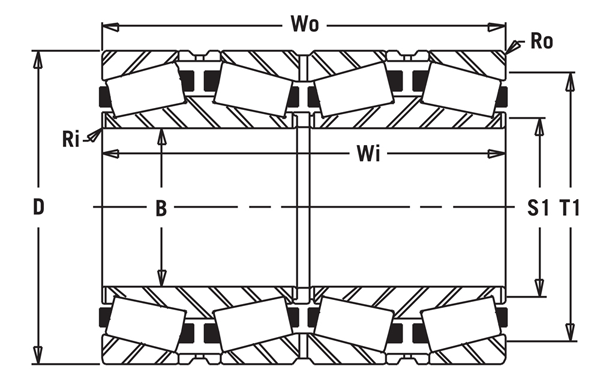 The difference between a TQO bearing and a 2TDIW bearing design are relatively minor, as each uses two TDI cones. The TQO design uses: two TDI cones, one double cup in the middle, two single cups one on each end, two cup spacers, and a cone spacer. The 2TDIW design uses: two TDI cones, four single cups, three cup spacers. The cones are match ground, therefore no cone spacer is required. Either design can be supplied depending on the preference of the mill; however, the TQO is the most commonly used design. There are a variety of special features that can be incorporated in the design of four row bearings, such as: face notches, helical bore grooves, extended cones, re-lubrication accommodations, cup and/or cone seals, etc. All TQO bearings have their BEP pre-set at the factory. Many standard bearings exist with several different BEP values, depending on mill preference and the way they operate. Consequently, all TQO numbers will have an “LXX” suffix on the end indicating the nominal BEP value in thousandths of an inch.